When the temperatures drop and the snow flies, my mind races to a great bowl of chili. My oldest daughter, Megan, has been raving about the Paleo Chili, that I will refer to as Sweet Potato Chili. She is on a Whole-30 and Paleo diet, and she referred to this chili in her post on Life Love and Garlic. I modestly adapted the originally recipe and the result was amazing. I’m not on a Paleo diet, but I LOVE this recipe. I could see this recipe easily adapted to Vegan by browning mushrooms (with a dash of olive oil) instead of beef and substituting vegetable broth for beef broth. Chop onions and bell pepper and place in a large pot or Dutch oven over medium heat with ground beef. Using a spatula or wooden spoon to break up the meat, as it browns, into small pieces. Once the meat is browned and the onions are soft, drain fat if needed. Add crushed tomatoes, tomato paste, beef stock, and all spices except hot sauce and lime juice. Stir well. Add peeled and diced sweet potatoes. Bring to a boil and then reduce to simmer. Simmer for 30 minutes or until sweet potatoes are fork tender. Optional: Add hot sauce and lime juice. Taste. Adjust seasonings as needed. My earliest recollection of Chicken Tortilla Soup was at Tijuana Tilly’s in the ’80s. The soup was flavorful and came with a bevy of accoutrements. During weekend trips from Scottsdale to San Diego, we always tried to fit in a trip to Tijuana Tilly’s and take in a game of Jai Alai. Sadly, the days of Jai Alai at the Fronton Palace are gone, but Tijuana Tilly’s survives. We visited again, with our girls, in the 90s and it was equally as yummy. On cold winter days, I long for a yummy soup and Chicken Tortilla Soup was on my mind. I adapted a few recipes to come up with this version and it hit the spot! Place all ingredients in the crockpot and cook on low for 8 hours. About an hour before serving, remove chicken and chop or shred into smaller pieces and return to crockpot. Stir. If soup is too thick, add additional water and simmer for another 30 minutes. Serve in bowls with sides of shredded cheddar cheese and tortilla chips. You can also try sides of chopped green onions, radishes, avocado, fresh cilantro, and sour cream. Seafood Chowder for a cold winter’s night! Seafood Chowder is so easy and so delicious! I love recipes that are easy to prepare and contains items in your pantry and freezer. This Chowder fits the bill. My friend and former co-worker, Cyndi, shared this with me a few years ago and it’s a regular on my winter menu. Saute onion, celery, potato in butter for 5 min. Season with salt and pepper. Add can of corn and cream, season with pepper to taste, heat to serve immediately. It serves 4 smaller serving bowls or 2 large servings as main meal. Colorado weather is typically wonderful but as the locals say, ‘if you don’t like the weather, wait 10 minutes’. Last week we were blessed with much-needed rain that left a chill in the air and a craving for soup. My sister-in-law, Betty, has told me about the Chicken Quinoa Soup recipe she makes regularly, compliments of Iowa Girl Eats. It sounded like the perfect soup to satisfy my craving, and indeed it did. I’ve become a huge fan of quinoa, kale, and sweet potatoes and the combination in the soup is divine. The addition of the parmesan rind adds a wonderful salty/nutty flavor to the soup. I served with a fresh pretzel roll and loved every bite! A new favorite for my recipe box. Heat oil in large soup pot over medium heat. Add carrot, celery, and onion, season with salt and pepper, then saute until tender, about 10 minutes. Add kale and garlic, season with more salt and pepper, then saute for 2 more minutes. Add 7 cups chicken broth, parsley flakes, dried thyme, bay leaf, and parmesan cheese rind (if using), then bring to a boil. Add chicken breasts to the pot then cook for 10 minutes, or until no longer pink in the center. Remove to a plate then add sweet potato, russet potato, and quinoa to boiling broth. Place a lid on top, lower heat to medium, then cook for 10 minutes or until potatoes are tender and quinoa is cooked. Meanwhile shred chicken. Add shredded chicken back to the soup, remove bay leaf, then add parmesan cheese and stir to combine. Taste and add more salt & pepper if necessary. Serve topped with additional parmesan cheese, if desired. 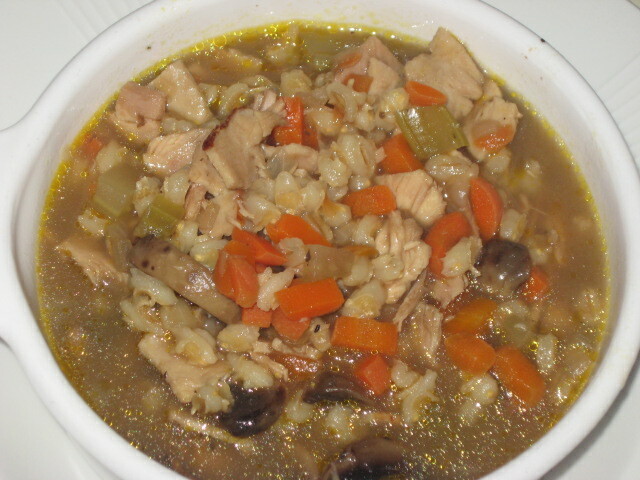 Use remaining 1 cup chicken broth to add when reheating soup, as quinoa will absorb much of the broth as it cools. SILKY SQUASH SOUP…Vegan and Delicious! Recently I started a 10-day cleansing/detox diet that requires that I eat primarily fruits and vegetables. I love both but don’t have a strong vegan recipe inventory. One of the bloggers I follow, Lucys Friendly Foods, recently posted a wonderful Silky Squash and Rosemary Soup. I did not have fresh rosemary on hand so I used a wonderful spice blend from Savory Spice Shops, Cantanzaro Herbs, a mix of Garlic, lemon peel, marjoram, basic, thyme, rosemary and oregano. The results were yummy! With the frigid cold this past weekend, it was the perfect time to match Hearty Minestrone. My good friend, Maribeth, introduced this recipe to me several years ago and it is a winter delight! Pair it with a crusty, hearty bread a nice glass of red wine and you can please family and friends alike. This soup freezes beautifully! With our busy schedules, what a treat to be able to have this soup on hand for those crazy, busy days we all have. If you are gluten-free, eliminate the noodles. Mmmm…making me hungry for another bowl of leftovers! In a large kettle, combine chuck roast, 1 teaspoon salt and water. Cover and simmer for 3 hours or until beef is tender. Remove meat from kettle and set aside. Remove fat from broth by letting kettle cool in refrigerator and then lifting hardened fat off top and discarding. Break meat into 1-inch pieces and combine with broth in a very large stock pot. Stir in celery, onion, carrot, tomatoes, parsley, tomato paste, salt, oregano, basil, kidney beans with liquid, garbanzo beans with liquid, pinto beans, spinach, zucchini and sliced sausage. Simmer covered until vegetables and sausage are tender, about 1 hour. Soup may be frozen at this point. To serve, cook noodles according to package directions. Rinse, drain and add to hot soup. Sprinkle each serving with Parmesan cheese and crusty Italian Bread. 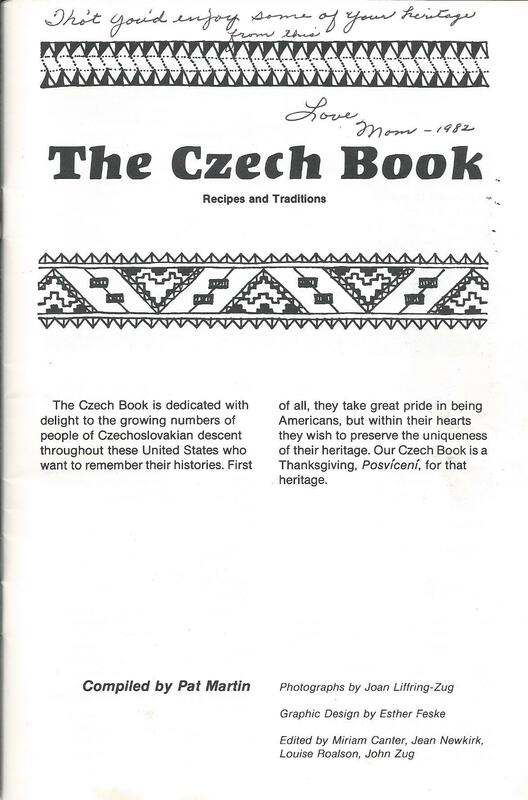 My Czech roots are precious to me and this week I enjoyed a hearty stock of Sauerkraut Soup. 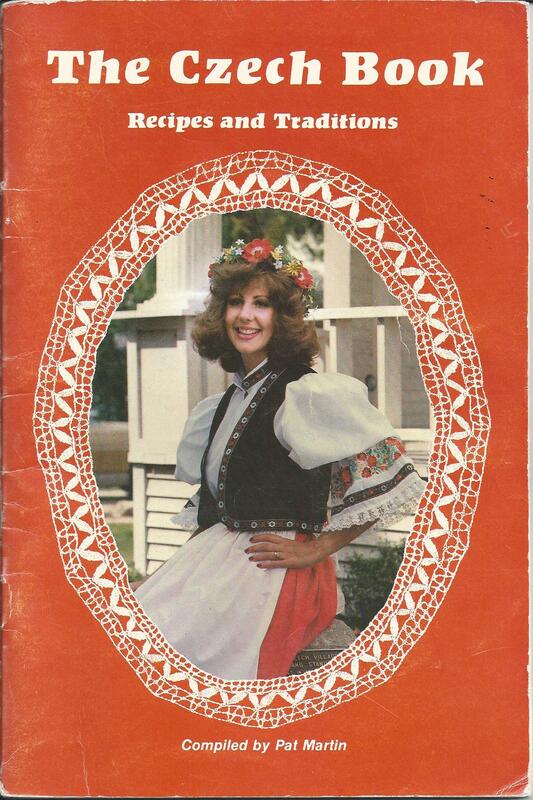 This recipe was one of two recipes my Mother made and she was given this recipe by our dear Bohemian friend, Blanche. I understand that many families serve a Sauerkraut Soup as a traditional Christmas Eve meal but I enjoy it anytime! After the rich, sweet treats of the holidays, the hearty sauerkraut soup was a welcome change allowing me to walk down memory lane once again. Put enough water on sauerkraut to simmer slowly with ham. When tender, pour milk over and a chunk of butter. Salt and pepper to taste. Break egg yolk into small bowl and whisk. Add flour and mix together. Drop small pieces of the dough into the soup until cooked through, 10-15 minutes. Add cooked, drained potatoes to the soup. Heat until low boil. Serve or cool to serve next day. The flavor is even better the next day! Returning from our picnic and hike, free time awaited and it was time to hit the hammock and soak in the amazing beauty of Finca Esperanza Verde (FEV). Truly a slice of paradise. Every time I looked at the horizon from FEV’s dining area, it looked different. It was a magical experience. Again, this evening there was a wonderful sunset and shadows not to be missed. A wonderful day, with wonderful people, in a wonderful place. The air was cool and the vegetable soup for dinner hit the spot. 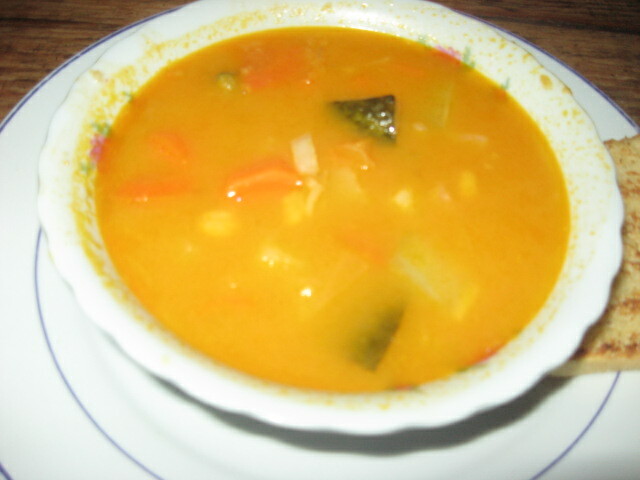 It reminded me that vegetable soup is a world staple, using local vegetables, spices and traditions. Comfort food for the soul. 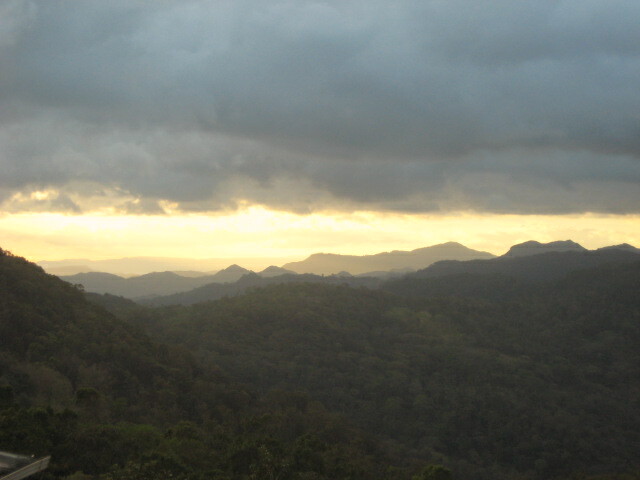 As the sun set, so did our eyelids, tired but satisfied with another wonderful day in the beauty of Nicaragua. Tomorrow we would host local school children, on holiday, for a morning of music, art and fellowship. 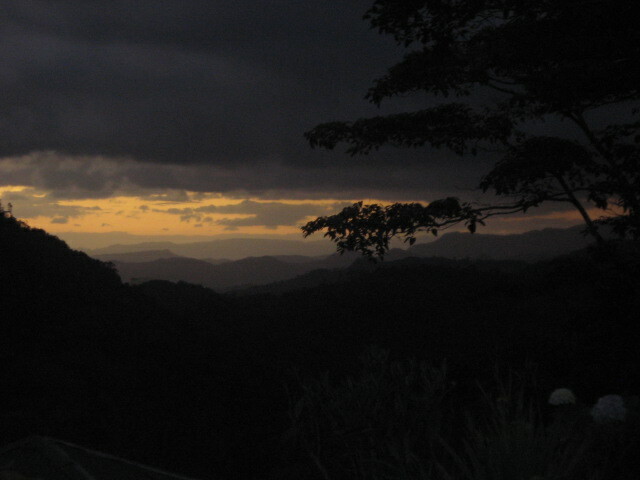 Note: The stories of Nicaragua continue for the next several Tuesday postings. Mushroom and Barley Soup…a Czech winter delight!